We have a very exciting announcement for you today! 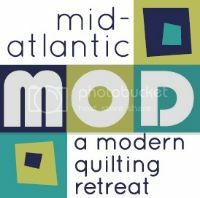 Victoria Findlay Wolfe, award winning quilt artist, will be visiting the Philadelphia Modern Quilt Guild on February 28, 2014 at the URBN Annex of Drexel University (click here for a map). 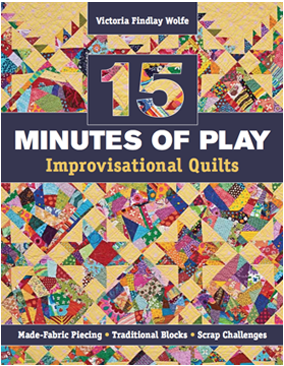 She will present a lecture and quilt trunk show titled "15 Minutes of Play." Victoria's lecture is a walk through of her quilts showing how she got her start in quilting at a very young age and her progression as a quilt artist. She talks about her inspiration, and how she found her "15 minutes" journey. Plus, how it works, why it works and what it does for her creative process. She will show many quilts to inspire attendees to get excited and ready to PLAY! The lecture is scheduled to begin at 7:00 PM and will run about 1.5 to 2 hrs. The lecture is free for all Philadelphia Modern Quilt Guild members and for all Drexel students and staff. All other attendees are $5 payable by cash or credit at the door. No advance purchase is needed. Victoria will sign copies of her book "15 Minutes of Play," which will be available for purchase in limited quantities at the event. Victoria Findlay Wolfe (http://www.15minutesplay.com/p/about.html) is a New York City based award winning quilter, fabric & thread designer, and author of 15 Minutes of Play (C&T publishing), Founder of NYC MOD quilters, Board member of the International Quilt Association, the Quilt Alliance, and runs several community drives with BumbleBeansBASICS. Born and raised on a farm in Minnesota, She credits her quilting influences to her grandmother’s double knit crazy quilts that kept her warm, growing up. Her biggest supporters are her husband and daughter.